Home » Health » What Is Tinea Capitis? Tinea Capitis is a disease caused by a fungal infection of the scalp. The disease is highly contagious and mostly affects children, ranging from toddlers to school age. 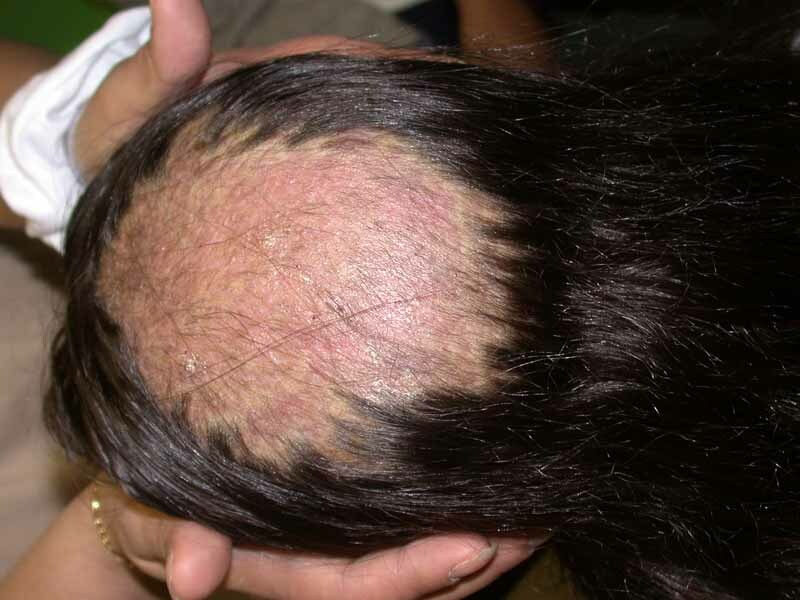 Complications of tinea capitis may include hair loss and permanent scarring of the scalp. Symptoms of this disease may vary in each patient. But generally the scalp of a person affected by this disease will feel very itchy. In addition, on the scalp will look round the bald, scaly, red, and sometimes swollen. Baldness can also occur in the infected area. Usually on the side of the head that experienced baldness will look the pattern of black dots that actually is a broken hair. In the case of severe tinea capitis, there is a scar on the scalp that secretes pus. In addition to the above symptoms, tinea capitis can also be accompanied by swollen lymph nodes in the neck and a mild fever. Tinea capitis is a contagious disease. Infection attacks due to dermatophyte fungus on the outer layer of the scalp and hair shaft are the main causes of this disease. See a doctor if you have symptoms of tinea capitis. Usually the doctor will be able to directly diagnose based on symptoms suffered and observation of the scalp of the patient. When observing signs of infection on the scalp, doctors will usually need a tool called Wood lamp. To strengthen the allegations, doctors will usually suggest follow-up tests. One common test in tinea capitis is a fungal culture test by wiping the infected part. The results of this test usually can be obtained within three weeks. In addition to the fungus culture test, another test that can be done is a scalp biopsy. However, this test is rarely performed. Microscopic examination of the hair or scalp scratches is also possible. In treating tinea capitis, doctors will usually combine a special shampoo with oral medications (drugs taken). Oral medication serves to kill the fungus that causes tinea capitis, while the shampoo serves to prevent the spread of infection and eradicate fungal spores on the head. The most commonly prescribed oral agents for tinea capitis are terbinafine hydrochloride and griseofulvin. While the prescribed shampoo usually contains selenium sulfide (at least 2.5 percent) and ketoconazole. In order for the treatment to be effective, it is important that you use the medication for a set period of time. Usually doctors will recommend using terbinafine hydrochloride and griseofulvin for one and a half months. As for the use of shampoo in general is several times a week for a month. When using an anti-fungal shampoo, leave the shampoo on the head for 5 minutes before rinsing. If still not clear, ask your doctor about how to use the correct antifungal shampoo. Wash your hair and scalp regularly with shampoo. Do not share the use of items, such as combs, towels, and clothes, with others, or lend them with others. Sharing information about tinea capitis with others on how to avoid getting infected and how to prevent it. 0 Response to "What Is Tinea Capitis?"